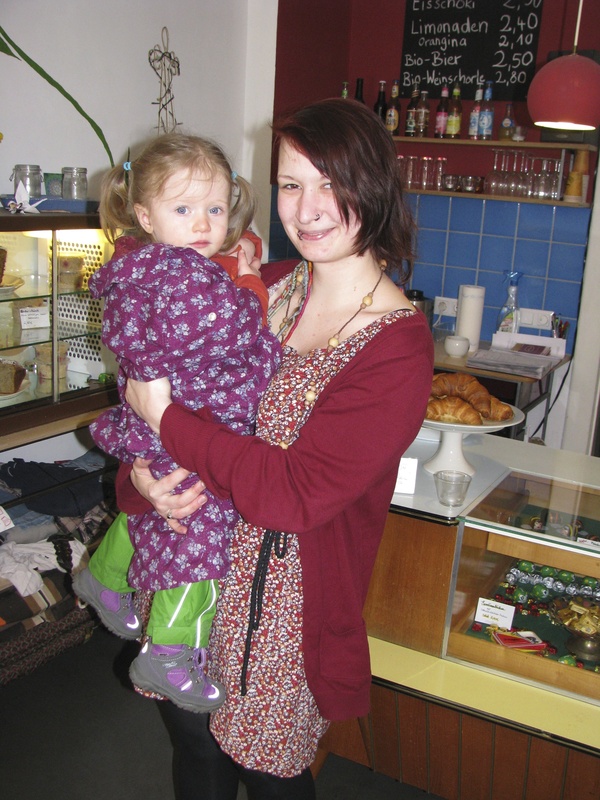 Amaya and I have sampled many a coffee in our short stay in Berlin. There is the fluffy duck cafe, the balloon cafe, the slide cafe, the milk cafe and the most favoured of all (and not strictly a kinder cafe) – the lady cafe. Not the real names, but the names bestowed by a toddler. The Lady cafe is ironically named Sommer Haus, is just around the corner from where we live, is cool in a Hipsta sort of way, does great coffee and has toys and books for Amaya. What’s more the owners are actually friendly and talk to us beyond the basic transaction exchange! Kinder cafes are our other staple and often involve play equipment, toys books, screaming children and varying quality of food and coffee. The basic idea is that parents sip lattes in peace while children occupy themselves. They have been a lifesaver considering how bad the weather has been. Amaya in the “lady cafe” with Majo her favourite lady! This would normally be in a bottom 5 but Berlin have somehow managed to foster a vibrant culture of graffiti without it being about vandalism or contributing to urban decay. In fact graffiti seems to add to the ambience of the city and give it a certain charm. Even the graffiti in our local kids playground adds to the fun of the place! Between the fantastic public transport system (which should really make the top 5 but is a bit boring to write about) and the amazing networks of bicycle paths, one does not need a car in Berlin. This has been a huge relief and contrast to our car centred Sydney lives. I had previously imagined that cycling would not be a thing we did during the winter, but I have found myself cycling down the street, with Amaya in tow, in all sorts of inclement weather. And the best thing is I feel safe doing it. Motorists are incredibly aware and considerate, once again a contrast to the Australian experience. For anybody who has been doored you will see the wisdom in the design of this bike lane! Thanks to a strong tradition of German archaeology in times gone by, coupled with their willingness to plunder everything they discovered and transport it back to Germany, the Museums in Berlin are nothing short of astonishing. I must have visited close to 20 museums and haven’t even scratched the surface. Highlights were definitely the Pergamon Museum, the Jewish museum and the Neues Museum. Berliners are so passionate about museums that they even have “Lange Nacht der Museen” (long night at the museum), where for 18 euros you can gorge yourself on museums from 6pm till 2am. I managed six including the very trippy Hemp Museum, where I drank hemp tea and ate hemp cake! 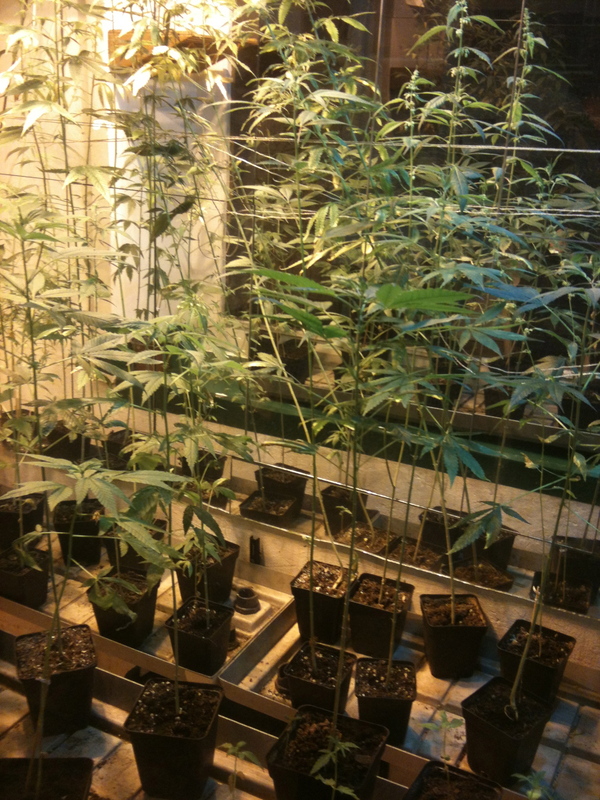 A very serious museum about hemp! This is where we get to have a good whinge. To our friends from Berlin – please don’t take this personally – you are all obviously the exception to the rule – we love you and Berlin wouldn’t be half as good without you! Seriously while snow is cool and is a novelty for us Aussies there is only so much one can take. I am finishing this off from Barcelona where the weather is sunny and 17 degrees. When we left Berlin yesterday there was still mountains of snow on the ground and the promise of more to come. I will not miss having to put on my entire wardrobe before walking out the door, nor will I miss having to dress and undress a wriggling toddler every time we exit or enter a building. I think we have been particularly unlucky with the weather. It has been the darkest winter in 140 years and the coldest March ever! Cold is one thing, never seeing the sun is quite something else. November, December January, February and March – 5 months of freezing cold, overcast, ice, snow, hurts to go outdoors, everybody hibernates. Definitely a major subtraction to quality of life! 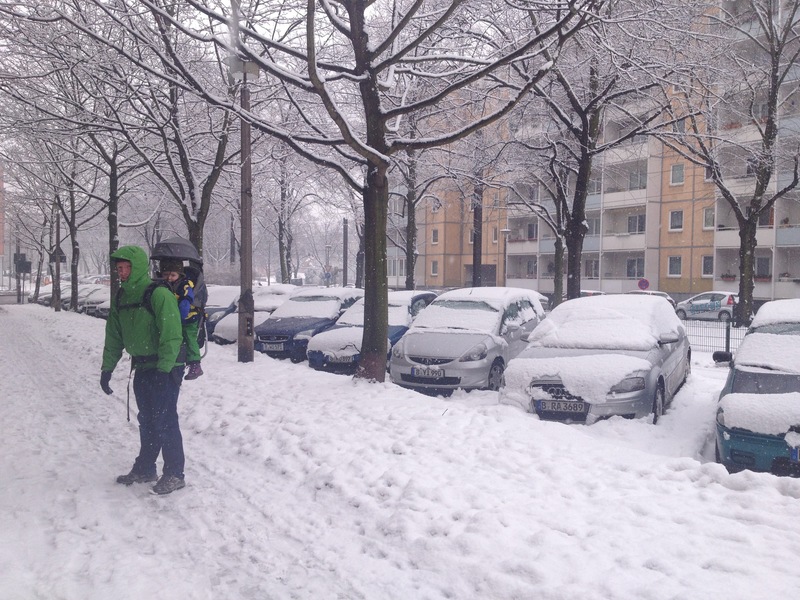 This was taken on the 29th of March – nice spring weather! If people are so intent on owning a dog and thereby contributing to global warming and the global food crisis, then the least they can do is clean up after their animal! This is a problem all over Berlin and one has to be ever cognisant to avoid an unwanted mess. Berlin with its relatively cheap rent and hot international art scene means there are more commercial galleries popping up than you can poke a stick at. But the ease at which one can hire a space, strew a smattering of art around the room, then shout free beers on the opening night to draw a crowd means that anyone can do it. The result – art lovers having to wade through a heck of a lot of crap to find anything notable. Michael is even thinking of putting together an installation of Dog Turds collected from a wide variety of Berlin neighbourhoods. Maybe I’m going to the wrong places, or am currently too obsessed with painting, or maybe I simply don’t know enough about art to appreciate whats going on here, but I am so sick of conceptual, found object, poorly executed, adding nothing positive to the human experience, installation, crap exhibitions that I will never step foot into a commercial gallery in Berlin again. An actual term to describe the curt, abrupt and unfriendly manner of many Berliners when interacting with strangers. Obviously our lack of German didn’t help our perception that Berliners were on the whole quite cold towards strangers. We were relieved to learn it wasn’t just us who were being given the cold shoulder, but rather Berliners were quite famous for their don’t mess with me personas. I remember catching the tram one day with Amaya in the baby carrier – she quickly established that the tram was like a bus and this was enough for her to burst into a loud rendition of “wheels on the bus.” Meanwhile our fellow commuters stood mere centimetres away, absorbed in their thoughts, as though nothing truly entertaining was occurring. Amaya sighted many a dog and patted none, as owners wouldn’t even glance sideways at her enthusiastic remonstrations. Any transaction in any shop, bakery, train station, photocopy place etc. is just that – a transaction – there is never a desire for small talk or an interest in the customers welfare. One day when I let Amaya pay at the grocery store I thought the checkout lady was going to kill me with her stern glare as Amaya fumbled with the 20 euro note. Anyway, I am sure everybody is lovely and wonderful – but there is certainly very little warmth. 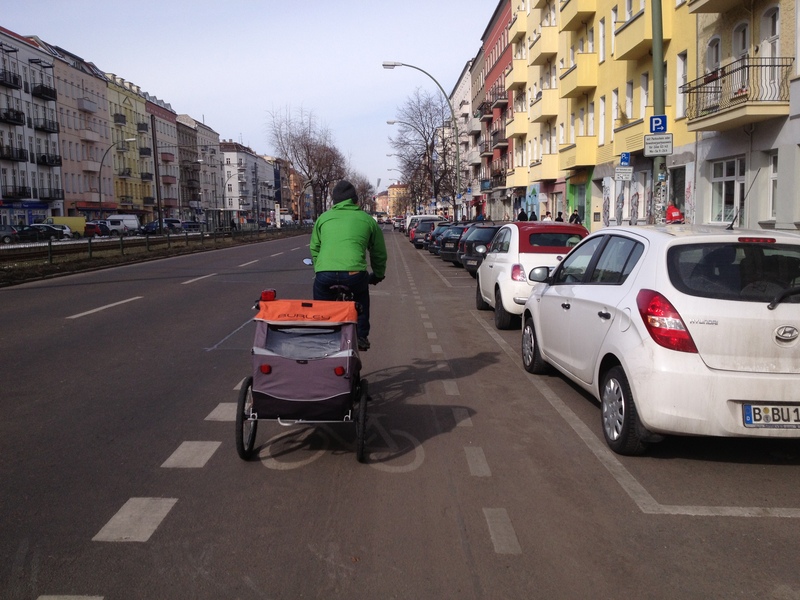 This entry was posted in Living in Berlin and tagged bicycle paths, Bottom 5 Berlin, great coffee, Top 5 Berlin, Top 5 Bottom 5 Berlin by babyonabike. Bookmark the permalink. ja u are sooo write about berlin. even though i am a berliner. 😉 i miss the snow…the bike ways. ..the agypt museum….the parent cafes…and and and. dog poo…dont have to say anything about it. anyway have lots of fun in spain…with sun and warm weather. CLEARLY the last item in your “Berlin Bottom 5” list is that I am not in that city. I assume you omitted that from the list because it is simply too painful to write about. That is such a shame about the art galleries! But I am very glad that I’m not the only one who “doesn’t get” the kind of art that you’re talking about (having lived in San Francisco, I can totally picture it!). I definately don’t think it’s because you don’t know enough about art. Your blogs are so well thought out, they are fabulous. I cannot wait to hear more! Luke and I miss you 3 terribly. Love it, reading your blogg and your berlin top 5th. i was born in berlin and left it 3 years ago. my point 5 for your bottom5 is the incessant noise.